You can easily make your own sweets and desserts without palm oil. If you are baking from scratch, be sure to avoid using shortening which usually contains palm. Most all store-bought desserts and baked sweets — everything from cookies and cupcakes to donuts and pies — use palm oil or palm kernel oil. Boxed cake and dessert mixes usually contain it. As with all products, the less ingredients something has, the better. While convenience is great, with a little planning, you can easily make your own. It’s often less expensive, healthier and fairly simple to make desserts without palm oil at home, even if baking isn’t your passion. These recipes take 5 – 15 minutes, and that includes the cleanup. All of these palm free dessert recipes are dairy-free. This makes it easy to be sure you will not have any palm oil derivatives. You won’t have to worry about the Vitamin A Palmitate — a palm oil derivative — which is added to most milks, even seemingly healthier ones, like commercial nut milk. This recipe has the bonus of containing avocado, which is a healthy fat. After you add all the ingredients, your kids won’t even know. It’s super creamy and best when it’s been chilled in the refrigerator. OrdinaryVegan.net has posted a tasty recipe. For an even greater nutritional impact, use a higher quality cocao, such as Navitas Organics. Their Organic Cacao Powder is fair trade certified and contains 25% daily value of Magnesium per 2.5 tablespoons. You can easily use Hershey’s Cocoa, 100% Cacao which is easy to find and also palm oil free. It’s also vegan and uses only four ingredients. You can also make easy substitutions for the sweetener as necessary. Wow! Another easy, healthy dessert without palm oil. Thank you to EatingBirdFood.com for posting this awesome chia seed pudding recipe. The recipes calls for unsweetened coconut, almond or cashew milk. Make your own so it is palm oil free. I’ve usually make this recipe with homemade almond milk but the last time I combined walnuts and almonds. If you own a food processor or Vitamix, it’s fast. Blend 20-25 almonds per cup of water in your Vitamix. The recipe calls for two cups of milk but you can make however many you want to. It’s fast and easy. Pour the two cups of almond or other nut milk into a mason jar. Add six tablespoons of chia seeds and any other flavors you want. The recipe suggests honey or maple syrup and vanilla extract. Shake. Set in the refrigerator for a few hours or overnight. When you are ready to eat it, you can top it with fruit or anything you want. The best part about this — aside from being healthy, easy, and delicious — is you can add anything you want to it. You can even add cacao powder or palm free chocolate chips. Sometimes when I’m making the almond milk, I add banana, raspberries, blueberries and/or strawberries for a sweeter taste. You can make it your own. According to MedicalNewsToday.com, chia seeds are good for you. They provide protein, fiber, and Omega-3 fatty acids and are rich in antioxidants. Prior to making this recipe, I’d never bought chia seeds in my life. I’m so grateful to Brittany at EatingBirdFood.com for posting this recipe. This makes for a tasty palm free dessert or snack as well as a great breakfast. As with all of these recipes, this is a tasty dessert without palm oil. You use 100% pure cacao which is naturally free from palm oil. You can find this easy recipe online from SweetLittleBluebird.com. This is one of the few mug cakes we found that didn’t include eggs. It tastes great! Also, by using almond flour, you can make it gluten-free as well. The thing to note about making this mug cake is that microwave times vary. Pay attention the first time you make it so you know the optimal time to get the consistency you like. You will be amazed at how delicious, fast and easy this is to make! This is another recipe from SweetLittleBluebird.com. Just like the Chocolate Mug Cake above, I made this cake several times, even before we started avoiding palm oil. It’s fluffy and moist, easy to make, and delicious. The beauty of this cake is it doesn’t use eggs, butter or dairy. You won’t miss them. In addition to making Crazy Cake cupcakes, which worked perfectly, I used the batter in my two donut makers. It’s exceptionally difficult to find donuts without palm oil so I wanted to see if this recipe would work. It worked great in both of them. I used a plug-in mini donut maker. My other donut maker makes regular-sized donuts. It’s the type where you pour the batter in the donut-shapes and put the pan in the oven. This cake recipe turned out really great in both makers, and now we can enjoy cakes, cupcakes and donuts without palm oil. Read this to find pre-made cookies without palm oil in stores. Even the ready-made tubes of cookie dough usually contain palm oil. What’s nice is the recipe from ChemistryCachet.com calls for just seven ingredients, one of which is coconut oil. Use her tip which is to separate the dough so it’s easier to roll out. This recipe took just 15 minutes for me to get the dough in the oven and everything cleaned up. That’s a lot less time than running to the store. It’s lots healthier too. These are easy to make as well are moist and delicious. I stored them in a sealed bag in my refrigerator, and they were good a week later. You could freeze them even longer which is prefect to make in advance for when you need them. This palm free dessert has the added bonus of starring a healthy fruit. Downshiftology.com has some great tips to make frozen bananas. You can make this a two-ingredient recipe, using just the banana and the chocolate. Just be sure to find melting chocolate, chocolate bars, or chocolate chips without palm oil. In addition, you can add whatever toppings you want, just be sure they are palm oil free. Some examples include nuts, shredded coconut, nut butter, chocolate chips, dried fruit, and regular M&Ms. This is especially fun to eat in the summer. Bananas are really great for their texture, especially when blended from frozen. Plus, it’s another dessert without palm oil that’s on the healthier side. If you’ve looked in the store for palm oil free ice cream, you know how hard it is to find. In additional to the easy-to-see-on-labels ingredients, palm oil and palm kernel oil, ice cream manufacturers use a common palm oil derivative known as mono- and diglycerides. But if you have a food processor or blender, you will be amazed at how easy it is to enjoy this palm oil free ice cream, even if you aren’t particularly fond of bananas. I use a Vitamix but any food processor will do. This tastes so unbelievably much like ice cream, you will be amazed. It’s so simple! Slice bananas and freeze up to three or four bananas in a sandwich-sized Ziploc bag. Try to freeze them so they are in a single layer, rather than balled up. Note: Several times, I sliced over a dozen bananas and put them in a gallon-sized Ziploc. I don’t recommend it. You don’t want the bananas to clump because it makes it really difficult for your food processor to whip them up. Another tip is to cut the bananas every which way so they don’t nest together. Once the bananas are frozen — they don’t even need to be frozen solid — put them in the food processor or Vitamix. Add vanilla extract to taste — approximately a quarter teaspoon per three bananas. Add cacao powder to taste. You can add a few tablespoons, depending on how many bananas you have. You can also make a larger batch of this banana ice cream and freeze for later. Blend until it’s the consistency of ice cream. It’s a really tasty dairy-free and palm oil free ice cream treat that amazingly has the consistency of ice cream. While it’s awesome with vanilla extract and the cacao, you can add anything to it. Instead of vanilla, use peppermint extract. You can blend in strawberries and/or slice them to mix in for strawberry ice cream. We use organic vanilla extract which has a much better chance of being palm oil free. You can add nuts, other fruit, etc. for more variety. Like in the other recipes, you can use the easy-to-find Hershey’s 100% Cocoa powder. For an even richer flavor, use fair trade certified Navitas Organics Cacao or other 100% cacao powder. 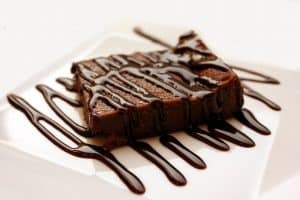 If you are looking to make desserts without palm oil, brownies are an easy choice. We love these brownies made with olive oil from SimplyWhisked.com. So many recipes are created using canola oil, yet olive oil is much healthier. Prep time for these is about 15 minutes. Once you’ve boiled the water, it’s fast to make. It requires 10 common ingredients. However, while this recipe has more ingredients than the others listed, they are common ingredients you may already have or can easily get. Some of them include cocoa powder, vanilla extract, sugar, eggs and baking soda. The brownies are moist, chocolately and delicious. We love homemade from scratch brownies best but we have found very good brownie mixes without palm oil. They are simple to make. Just add oil (canola, soybean, olive oil, etc. ; just not palm oil), water and two eggs. Shortening contains palm oil and palm oil derivatives. Use real butter instead of shortening in your favorite recipes and especially in pie crusts. Doing online searches, you can find ways to make whipped topping without palm oil by using heavy cream without Vitamin A Palmitate. Avoid canned frosting which contains palm oil. You can easily make your own with confectionery sugar and real butter. It’s easy and palm oil free. There are many recipes online. See more ideas for holiday desserts here. Avoid vanilla chips and white morsels as they typically contain palm oil and palm kernel oil. Unless it states “white chocolate,” the baking chips will mostly contain palm oil in some form. The same is true for flavors of baking morsels and chips such as raspberry, peanut butter, and butterscotch, etc., which contain palm oil. You will have a much better chance if you buy milk chocolate, semi-sweet, and dark chocolate baking chips. Yes, it’s hard to walk past the bakery departments in our grocery stores being tempted by all the scones, cookies, cupcakes, brownies, donuts, pastries, muffins, cakes, tarts, pies and torts. But when you take a minute to look at the list of ingredients, you will be sure to find palm oil, palm kernel oil and other palm oil derivatives, especially if there are many ingredients in it. So make your own! By knowing exactly what’s going into your desserts, you can be sure they are palm oil free. Once you know the ingredients to watch out for, it’s much easier to choose palm oil free products. And if you feel like a snack, be it sugary or sweet, see our list of palm oil free snacks as well. Please know, I don’t like to cook or bake but I am trying hard to make healthier choices for my family. But even though I am a very novice baker, I’ve made all of these recipes successfully, some multiple times. They are so easy to do. And they all taste amazing. You will absolutely not miss the commercial bakery with artificial and chemical ingredients at your grocery store. Palm oil wrecks havoc on our planet and also makes my son incredibly ill. By eating healthier and more “from scratch,” it’s a lot easier to avoid palm oil. Learn about the ways companies use palm oil so you can avoid it. We will continue to update this post with more recipes for desserts without palm oil. Please share your favorites in the Comments. Again, thank you for supporting palm oil free desserts, baked goods, frozen novelties and treats. Please always read labels and be a proactive consumer. By making desserts at home, you can be sure you are enjoying desserts free from palm oil and derivatives. To the best of our knowledge, these products and recipes are free from palm oil and palm oil derivatives. Please use it as a reference point as you do your own due diligence.